YEREVAN, Armenia — On January 18, 2018, Ani Baghumyan, a senior majoring in English and Communications at the American University of Armenia (AUA), published her translation of American journalist and writer Joan Didion’s essay “Why I Write” in Inknagir. 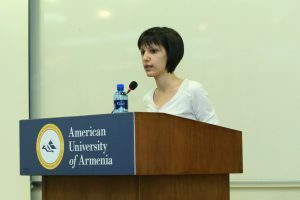 The translation was part of her individual project in the course Literary Translation (Spring 2016) offered to students in the Writing and Translation track. The translation is preceded by a short translator’s note about the author and the relevance of her piece to the Armenian reader. Edited by Violet Grigoryan and Vahan Ishkhanyan, Inknagir is known for featuring unconventional, cutting-edge literature that experiments with form and content. Ani is also the 1st place winner in the 2016 Arditi Essay Competition and her co-translations of essays by contemporary American theorists Fredric Jameson and Cornel West as part of collective translation projects have appeared in Inknagir and Arteria.